Chris Bolton with the help of Lindsay Bach ran the line boat while Bill Kleysteuber & Frank Gallagher ran the mark boat. The water was so low in the river from the previous two days of strong northerly winds that Chris was forced to set us up in the cove. The wind was very patchy and could switch 180 degrees between the windward and leeward mark. The lead boat around the leeward mark often lossed that lead on the short beat to the finish as a result of big wind shifts that would lift the 2nd boat to the finish while leaving the lead boat stranded. 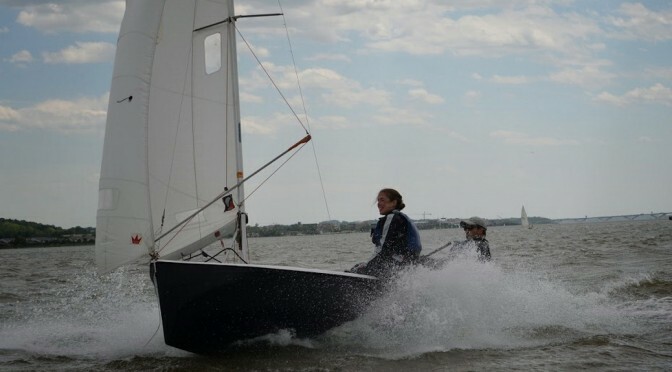 Len Guenther managed the conditions with patience and won the regatta. What a fantastic turnout for the PRSA Spring Regatta! We had nearly fifty boats and almost 100 sailors out racing over a fantastic Memorial Day weekend. Even though Saturday’s wind conditions were light and spotty we still got in 3 races on the upper course (and more on the lower course), followed by a wonderful BBQ put together by Lee, Lisa-Marie, and Jim. It was great to see so many friends and family members at the post-race BBQ. Our patience on Saturday was rewarded with a nice 8-10 kt southerly breeze on Sunday. After 3 more fantastic races on Sunday we enjoyed another nice BBQ. 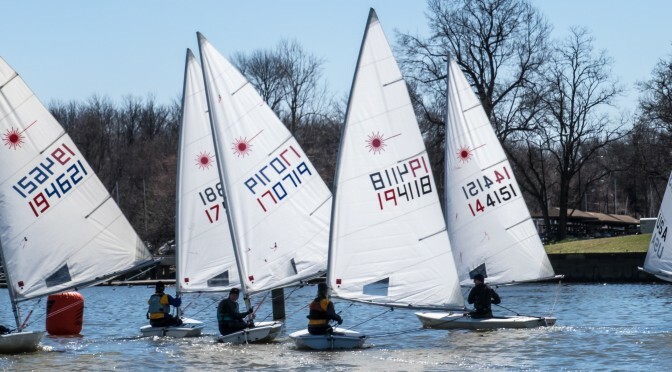 On January 1, 1974, about the time of one of the first Hangover Regattas, the Potomac River Laser Fleet was comprised very similarly to today’s fleet, with the British Naval Attaché as our fleet captain, Turkish diplomates, Lightning sailors, 470 sailors, Jet 14 sailors and numerous high school sailors. Mark Bear and I were two of those high school sailors. With the guidance of Peter Syverson the Potomac boasted one of the first Laser fleets. There was one important difference, however. In 1974 Northern Virginia had yet to experience its huge building boom. The Sailing Marina was uniformly 14 feet in depth across the cove to the airport rip rap. We regularly held huge events in the cove including such deep water boats as Stars.Today, much of Arlington and Falls Church have washed down Four Mile Run into our cove and center of the river. Nabeel, our RC chair, citing the extreme low tide, wisely elected to head north to avoid the shallow conditions downstream from the marina. As we headed for the race course both old timers such as Mark and Michael, and even fleet regulars such as Dan and myself( I am almost a regular), found themselves glued to the bottom just inside the last day mark. Fortunately, I was able to spring free just in time to make the two minute horn. I was able to convince Nabeel to postpone to accommodate our less fortunate fleet members. Once we all assembled at the race course we found a surprisingly nice place to race. The tide conditions we very simple, with the flood quite pronounced on the left, channel side of the course, while quite benign on the right, landing pier side of the course. The cove gave the breeze a much better fetch than we experience either racing inside or in the more recent Marina Towers race area. The breeze seemed to fit Sail Flow’s forecast almost perfectly at 7-18 with about 60-65% of the larger shots coming with a fair amount of west and far fewer coming from 180. The line was rather long and seemed to be square to pin biased all day. My strategy for the day was simple, find a relatively clear spot on the line where I could always be in phase, and hopefully working right. In the first race that strategy seemed to pan out until one of those 35% probability lefties scrambled the weather mark rounding. I believe Mark and Len escaped most unscathed. The lesson learned for the day was, while favoring a side, given the puffy nature of the breeze, I was never going to sail to either layline again. As the day progressed, I generally found the right and middle of the start appealing, despite the pin bias, so that I might be one of the first to take advantage of the relatively few truly lifted port tack beats. I tried to anticipate the starboard gusts, remaining content to sail around the entire”catspaw” of the right hand blast to avoid that fate of race one. In general, I found most boats playing the right sailed far too close to the pier and lost huge amounts as they sailed back to the mark in reduced pressure or a slight knock. Every so often sailing hard to one or another side paid off as Eric will attest in the last race. Downwind, I concentrated on a technique that I have watched my son, Alex employ very effectively all fall. At all costs, I sailed to the big blasts. Once in the blast I attempted to position my boat so that I sailed as close to rhumbline as possible. In one instance I rode the blast a tad too far, crashing on my jibe just to leeward of the leeward mark. 3. Always seek pressure downwind. 4. Appreciate the awesome volunteers that make our sport great. Thanks to everyone who missed sailing to run races yesterday and all year. Happy New Year! And a special thanks to Carl Schaefer for taking photos.